Today, in the early days of the Trump administration, roughly nine-in-ten Democrats (89%) say news media criticism keeps leaders in line (sometimes called the news media’s “watchdog role”), while only about four-in-ten Republicans (42%) say the same. That is a 47-percentage-point gap, according to a new online survey conducted March 13-27, 2017, among 4,151 U.S. adults who are members of Pew Research Center’s nationally representative American Trends Panel. The gap stands in sharp contrast to January-February 2016, when Americans were asked the same question. Then, in the midst of the presidential primary season, nearly the same share of Democrats (74%) and Republicans (77%) supported the watchdog role. Pew Research Center has asked this question since 1985. While Republicans have been more likely to support a watchdog role during Democratic presidencies and vice versa, the distance between the parties has never approached the 47-point gap that exists today. The widest gap up to now occurred during the George W. Bush administration, when Democrats were 28 points more likely than Republicans to support a watchdog role. It should be noted that prior to 2016, the question was asked by telephone rather than the web, which can elicit slightly different response patterns.1 Even taking possible mode effects into account, though, this year’s difference is so stark that it would still be the largest gap in the Center’s polling on this question. This partisan split is found in other attitudes about the news media, though none in so dramatic a fashion as with the watchdog role. 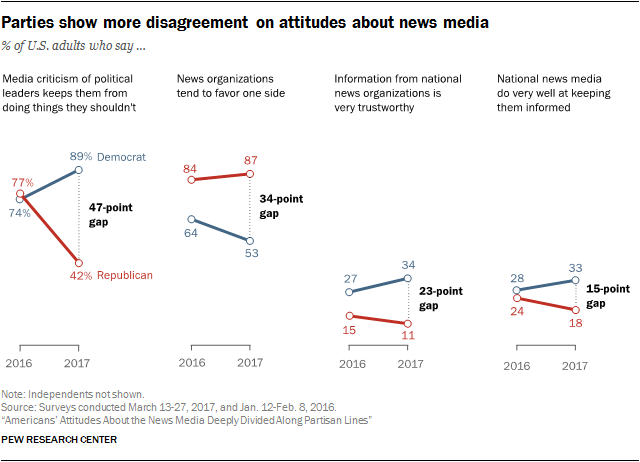 Compared with 2016, Democrats and Republicans are more divided on whether the press favors one side in its political coverage, on how much trust they have in national news media, and on how good a job national news organizations are doing in keeping them informed. The divide in news media attitudes also extends to Americans’ behaviors around news. Most prominently, Americans are also paying closer attention to national news now than in 2016, with that increase driven by Democrats. Overall, four-in-ten Americans report following national news very closely, up from a third the year before. Among Democrats, about half (49%) say they follow it closely, also up from a third in 2016. Democrats are also driving an increase in use of mobile devices for news. Nearly half of U.S. adults (45%) often get news on a mobile device. That is 9 percentage points above just a year ago, when 36% often got news this way, with significant growth occurring among Democrats but not Republicans. What’s more, an increasing share of Americans also prefer getting news on mobile over a desktop computer. Among those who get news on both types of devices, nearly two-thirds (65%) say they prefer mobile. Finally, one aspect of news consumption is little changed in either party: the role of friends and family as sources of news. Fifteen percent of Americans have a lot of trust in news that comes to them from friends and family (slightly lower than the trust levels for local and national news organizations), and 16% of online news consumers often get news there from people close to them (about a third as many as do so from news organizations). 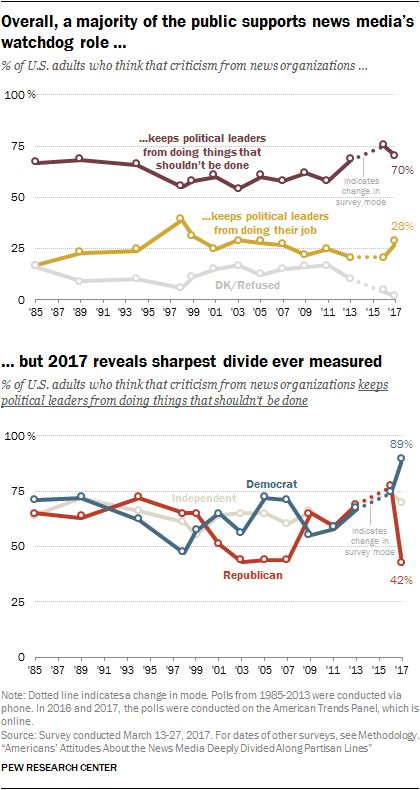 These figures are on par with 2016 and show less partisan divide than other measures – just a 5-percentage-point gap, for instance, in trust of information from family and friends. There was a slight uptick in the share of Americans who say the political news they get from friends and family represents just one side rather than a mix (40%, up from 35% in 2016), with Democrats and Republicans equally likely to say this. These findings are a part of Pew Research Center’s ongoing examination of Americans’ attitudes about the news media and consumption habits around news, including findings reported earlier this year that, even amid these partisan divides, strong majorities of both Republicans and Democrats feel the relationship between the press and the Trump administration is unhealthy and getting in the way of Americans’ access to political information.